Voice Overs for Film, Radio and Television commercials. Professional Voice Over Talent and Voice Over Actor. Voice Description: Signature Voice, Believable, Deep, Commanding, Friendly, Intelligent, Inflated, Intimidating, Scary Voices, �One of Da Boys!� Articulated, Compelling, Honest, Silly, High Energy, Over The Top, Tough Guy attitude, Ruff Gruff and Gritty, Guy Next Door, Laid Back, Funny, Cartoony..
Impersonations, Characters, Dialects and Accents include: International Self Important Villains, Drill Sergeant, New York accent, Russian accent, Irish accent, Scottish accent, Hillbilly, Redneck, Country Accent, Western Cowboy Accent, Suave Latino accent, Bandito accent, Southern Accent, Pirate, and British Voice Overs. Some Voice Impressions include Sam Elliott, Sean Connery, Optimus Prime, Hal 9000 from 2001 Space odyssey and the Robot from Lost in space. Specializing In: Commercial Voice Overs, Movie Trailer Voice Overs, Network TV Promo, Character Voices, Games Characters, Automotive Voice Overs. Experience: Started performing before audiences since the age of six singing, Year later becoming an award winning singer, then expanding to becoming a Songwriter/Musician. Performing as a Rock Band Performer for over 30 years being the Lead singer and front man to all performances and having to speak and announce In Public places. Got into Voice Over acting in 2010 and since then having done a Plethora of Local, National and International commercials, Education Videos, Rock Concert Promos. Some of My Clients are Bally Pinball Machines, Verizon Fios, Biofar, Booster Energy Drink, Playjumpstart.com, RFD TV, and Numerous Commercial Customers. Production Services: Dry Read, Fully Produced & Edited with music. Delivery Methods: mp3, aif, wav. Commercial Voice Overs, Radio Imaging, Animation Voices / Character Voice Actor, Movie Trailer Voice Overs, Narration, Network Promos, Automotive Voice Talent, Voice Actors and Professional Voice Overs from Voice Over Artists. IVR Voice Talent / Message on Hold Voice Over Talent. 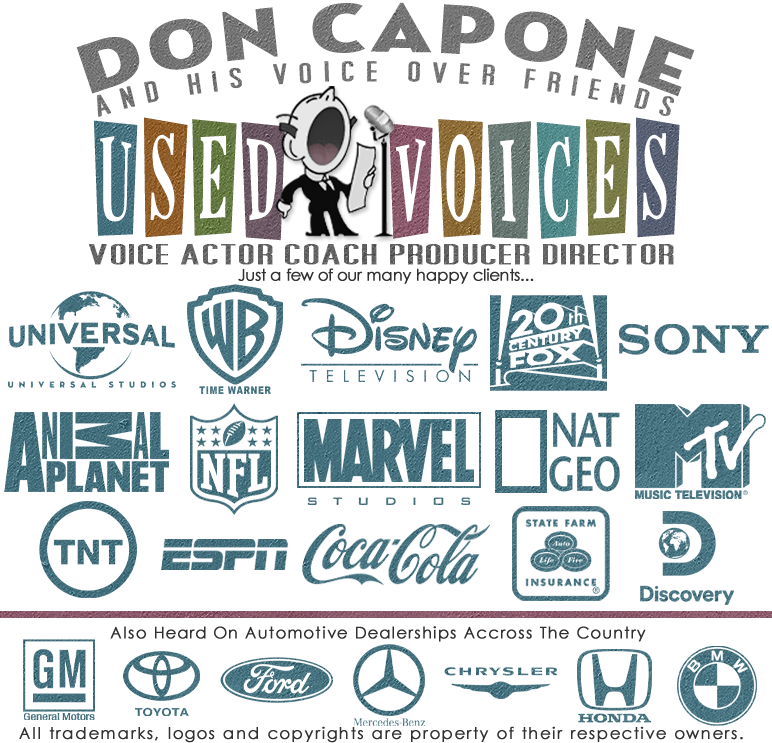 Find Voice Over Talent for Radio Commercials, TV Commercials, Movie Trailer Voice Overs, Documentary Narration, Automotive, Cartoon Voice Overs and Video Game Voices for Animation.